Men’s Ministries is looking forward to another great program year, including Bible studies, teaching, mentoring, work projects, and the Wild Game Banquet! We’ll get started with a Men’s Ministries Breakfast TODAY from 8-10am. Doors will open at 7:45am, and a pancake and sausage breakfast will be served at 8am. 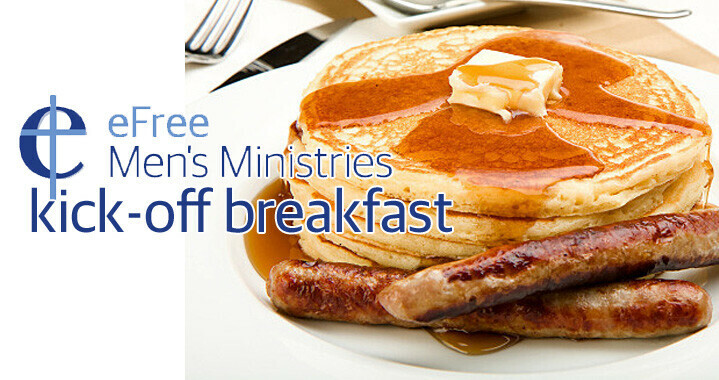 The breakfast is a freewill donation, with proceeds going toward other Men’s Ministry opportunities throughout the year. Following breakfast, Pastor Jon will share a devotional message, and then we’ll discuss opportunities to connect, grow your faith, and serve. Jeff Smyth will highlight the new video series for a Wednesday evening study. Pastor Aaron will discuss plans for a father-son study, and Mike Vaszily will talk about opportunities to serve in our Awana program. Please consider bringing your son(s) and/or friends — it’s a great way to connect and see where God will “grow us” this next year!